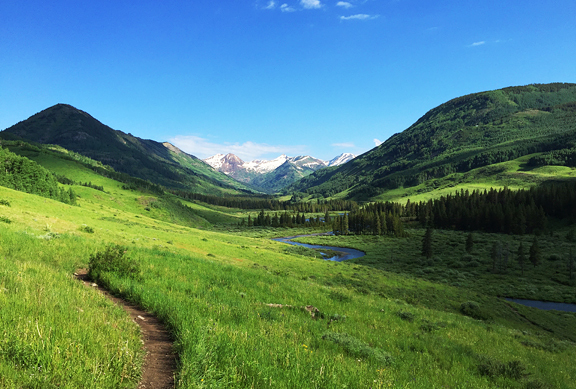 Wildflower season is exploding here in Crested Butte, and it’s not even peak yet! I know this because 1) I hike a couple times a day through fields of gorgeous wildflowers and 2) I’m sneezing constantly and my eyes are red and itchy. 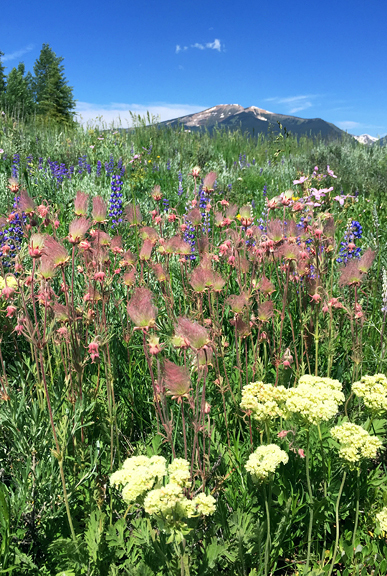 It’s not even the sheer quantity of the wildflowers, but the impressive variety that Crested Butte boasts. Right now we’re seeing larkspur, dwarf lupine, blue and crimson columbines, prairie smoke, cinquefoil, arnica, wild rose, sticky geranium, mule’s ear, wild iris, scarlet gilia, and so many more. I’ve resigned myself to not shooting the wildflowers this summer and just enjoying our hikes with Neva with occasional snaps of the iphone. 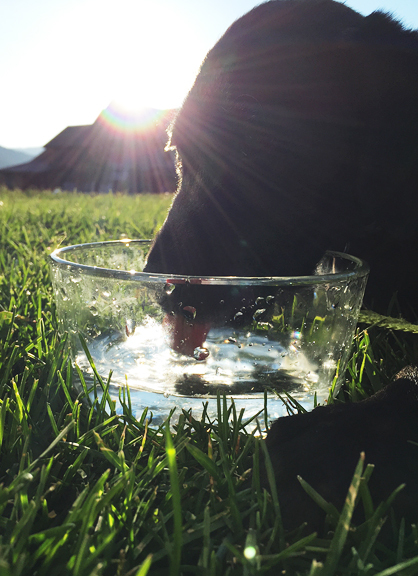 Neva has been on a regimen of hiking and swimming – kinda like puppy summer camp – to get her beans out each day (one of her nicknames is Nevabean). 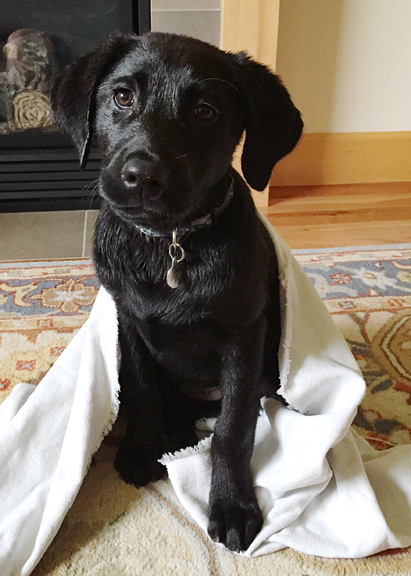 Not only do we have to socialize her with other dogs, people, and children around the neighborhood, but she needs to become familiar with dogs, wildlife, hikers, trail runners, and mountain bikers on the trails. Shortly before leaving for Crested Butte, we hung a bell on the doorknob of our front door. We rang it before taking Neva outside to potty a couple of times, and then we taught her to ring it and sit down at the door when she wanted to go potty. She picked it up right away. 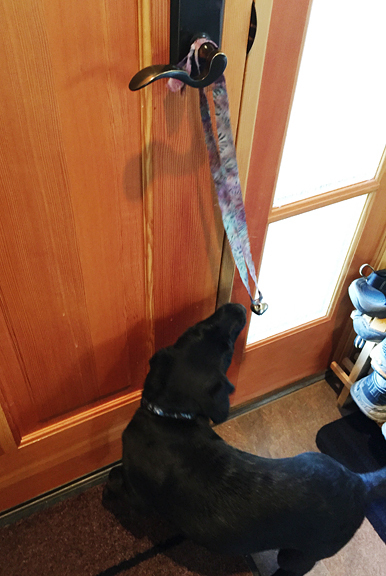 When we got to Crested Butte, we hung a bell on the front door and she rang that to ask to be let out to potty. We were overjoyed! And then she started to ring the bell minutes after she had just gone outside to potty… because she just wanted to go outside. She still rings it to go out to potty, but she ALSO rings it when she’s bored and wants to hang out in the yard. Hrmmmm. It’s a gradual progression, the parts of our lives that we are able to reclaim after the shock of puppy’s arrival. Instead of waiting for her to fall asleep before we can even think of making dinner, I can now cook while she’s hanging out in the kitchen or happily playing with her toys in the living room. Best of all, Neva has been exposed to a lot of thunderstorms and they don’t faze her one bit. 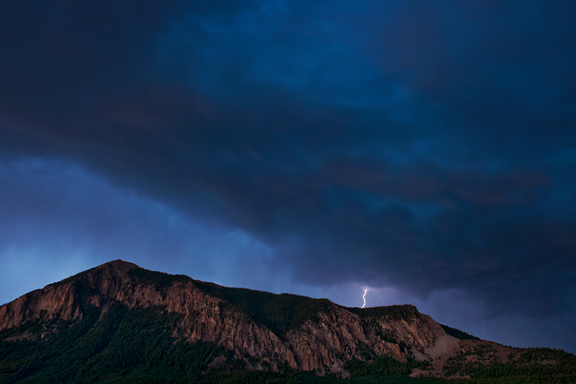 In fact, I was out shooting a storm as it lit up the mountains all around us the other evening and she was right there with me, playing with some neighborhood doggy friends and then calmly sitting next to Jeremy. We just want to raise her to have the happiest life possible. So far, so good. And for the past two weeks, Jeremy and I have been able to take shifts in the mornings so one of us can trail run while the other hikes the puppy. I had been on a 6 week hiatus because of the pup and my upper respiratory infection, so the first run felt awful, but in that good awful way. I felt free. And now I can enjoy the summer mountain views, watch deer bounding across the hillsides, make note of mushroom flushes, monitor the progress of the mountain huckleberries, and dream of the days when these slopes will be buried under feet of beautiful, skiable snow. I so love the mountains. After all of that rambling, I do have a recipe. It’s appropriate for the summer season, too! Before Neva joined our ranks, I had the luxury to think of new recipes I wanted to try. I ran them past Jeremy and one in particular piqued his interest – White Russian ice cream. I did some research and immediately found White Russian ice cream floats which combine vanilla ice cream with booze. That’s not what I wanted. A little more digging brought me to the wonderful world of boozy ice creams and their paradoxical existence. You see, boozy ice creams require booze. I’m not talking about a tablespoon of liquor, but a cup or more. The problem is that alcohol doesn’t freeze, and yet ice cream is frozen. The solution is gelatin. According to the two ladies who tested and developed this recipe, the process can be a little finicky. So if you’re serious about your White Russian ice cream, then follow the instructions. It’s best to make the custard a day ahead so it can chill completely. 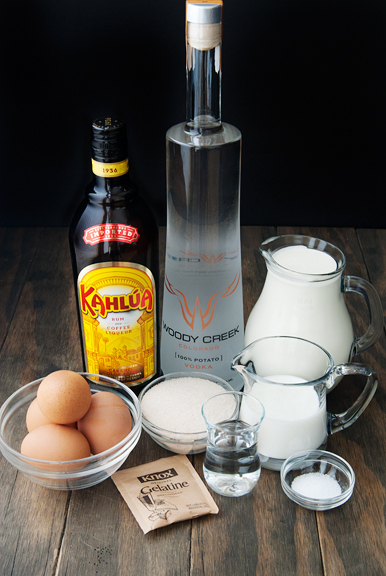 While you’re chilling the custard in your refrigerator, you should also pop your vodka and Kahlua in there too – you want both of those liquids to be cold. I have a fancy vodka pictured here, but you can use cheap vodka since it’s getting frozen and mixed with sugary, creamy things. Later in the day or the following day, you can resume your White Russian ice cream making session. Bloom the gelatin by sprinkling the powdered gelatin over cold water. Then heat the gelatin in a small saucepan over low heat. You don’t want to make it hot, you just want it to be warm enough that all of the gelatin has dissolved and become liquid. Next, whisk in the cold vodka and Kahlua. Don’t whisk lazily, but with gusto! Otherwise you might wind up with some solidified strands of gelatin. You want to avoid that because it means there’s less gelatin in your ice cream to keep it from being liquid. Do strain the gelatin-booze mixture, just in case there are tiny bits of chewy gelatin, then stir the mixture into the chilled custard. The ice cream sets up pretty soft and I am wondering if perhaps it would benefit from more gelatin or perhaps some melted white chocolate added to the custard when it is warm? I don’t really like white chocolate, but it would definitely add some structure. You basically have to scoop and eat the White Russian ice cream immediately before it starts melting. It has the texture of soft serve – smooth, creamy, very nice. Also? It’s DELICIOUS. This is my conclusion as well as Jeremy’s. It’s got quite the boozy kick to it as ice creams go. That was the whole point of this exercise. It tastes like a frozen White Russian cocktail because it IS a frozen White Russian cocktail! So don’t be serving this to little kids because then you’ll have drunk little kids running around. 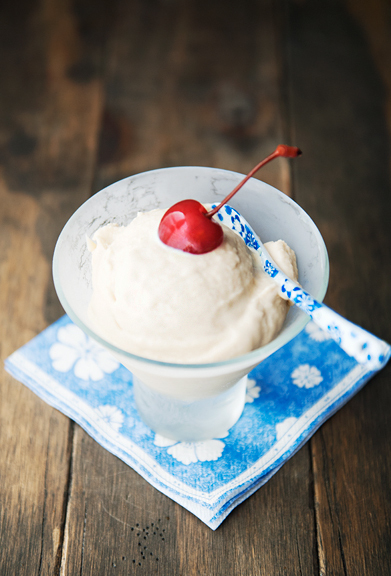 The extra step with the gelatin is worth the effort because – BOOZY ICE CREAM! Hell yeah, AMERICA! Enjoy your Fourth of July festivities, folks! 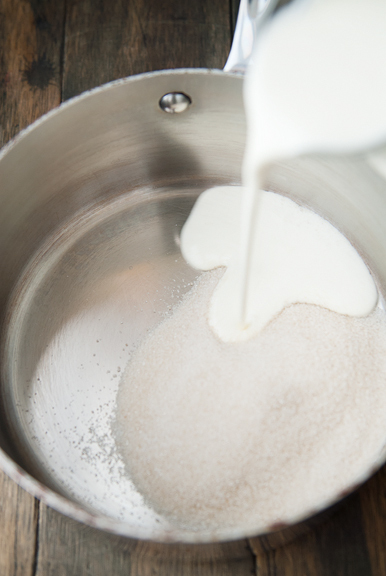 Make the custard: Combine the milk, heavy cream, sugar, and salt in a medium saucepan over medium high heat. 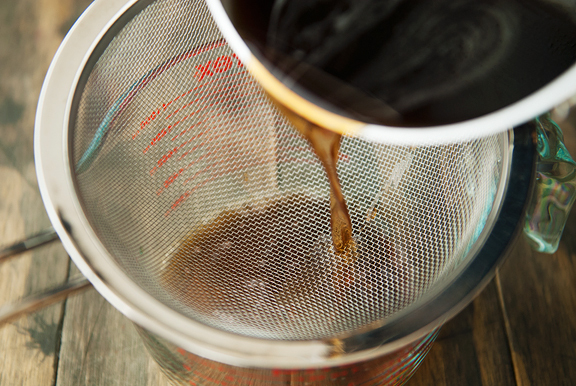 Stir to dissolve the sugar. Heat until the cream mixture is steaming, but not boiling. In a medium bowl, whisk the egg yolks to break them up. 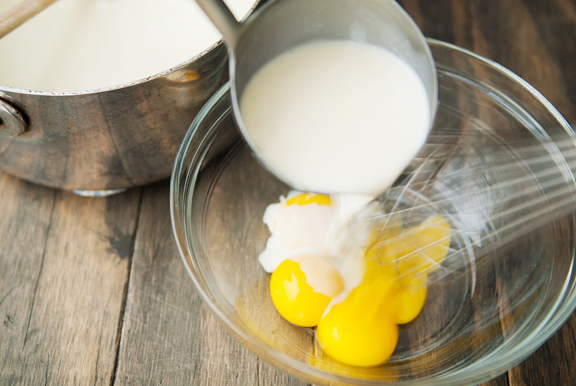 Whisk the egg yolks while slowly pouring a half cup of the hot cream into the yolks until incorporated. 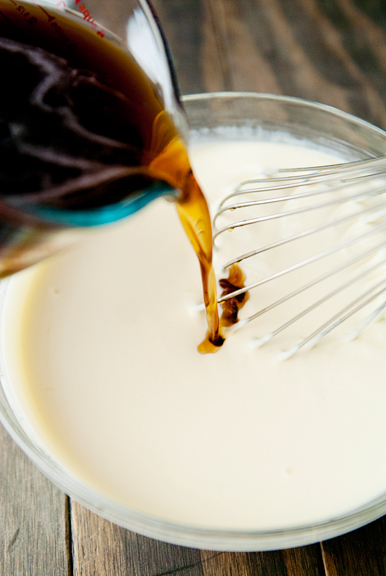 Whisk in another half cup of the hot cream. Now whisk the egg yolk-cream mixture back into the pan with the rest of the hot cream. 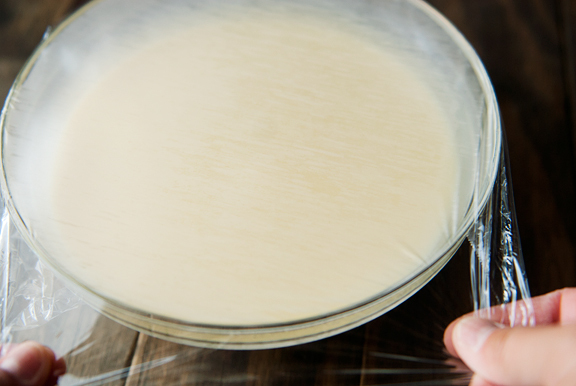 Set the pan on medium-high heat and stir constantly (with a whisk or a spatula – just be sure to get the edges of the pan, too) until the custard thickens enough to coat the back of a spoon. 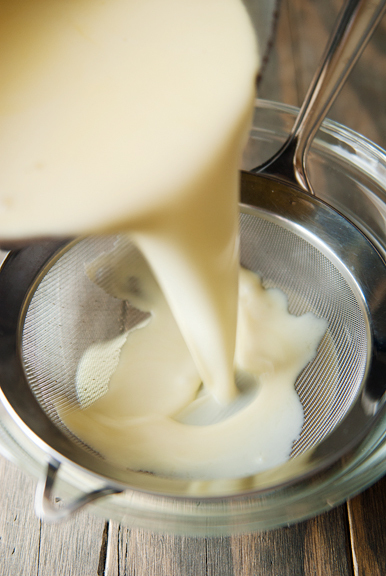 Remove from heat and strain the custard through a fine-mesh sieve. Chill the custard over an ice bath and then refrigerate until completely chilled. Measure out the vodka and the Kahlua and refrigerate. Give these at least 8 hours in the refrigerator or overnight. Booze up the custard: Pour the cold water into a small bowl and sprinkle the powdered gelatin over it. Let it bloom (sit) for 2 minutes. 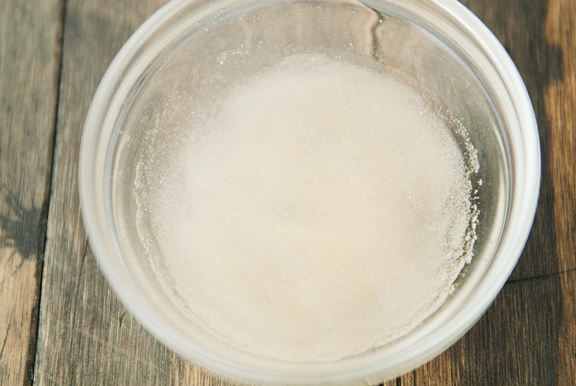 Scrape the bloomed gelatin into a small saucepan and warm over low heat. Make sure the gelatin is completely dissolved. 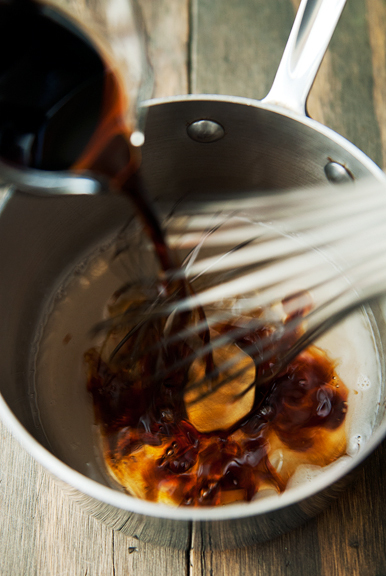 Whisk the chilled vodka and Kahlua into the warm gelatin. Strain out any lumps. Stir the gelatin mixture into the custard. Churn the custard according to your ice cream machine’s instructions and then freeze the ice cream. Makes 1 quart. So amazing that THAT view is your morning trail run. One of the most gorgeous photos. In your photography work, do you actually sell the seasonal landscape/nature photos? Or is it mainly food photography? Seems like the *best* job! CB looks beautiful this time of year! While I will admit, I have a total soft spot for black labs, Neva is just an absolute beauty! She’s so photogenic, she may need an agent ;) I miss you and hope things are well! Ringing the bell to go outside! HAH! Our little Black Lab Ruby (who looks like Neva’s twin sis) does the SAME THING! She rings and sits there waiting. And she also rings it when she wants to go out for puppy playtime. Love all the gorgeous puppy and nature shots! You are soaking up a beautiful phase of life right now. Our Sophie rings the bell now ALL THE TIME. It’s incredibly cute and incredibly frustrating at the same time. She’d be perfectly happy to just stay outside, I think. (Not happening.) If you find a solution, please let us know. I used to think that I was a good dog mom, but you guys put me to shame. What an incredible level of commitment to helping your little girl grow to be the best she can possibly be! I loved the bell story, the recipe, and once again, all of your wonderful photos. Thank you, Jen, for sharing your life with us! Honestly, who needs food with Neva and those beautiful mountains to play in? Pure Heaven and I am afraid I would never come inside long enough except to heat up frozen dinners just to get back outside again. I could completely adorn our house with just those pictures of darling Neva and those outrageously gorgeous mountain views you capture so perfectly. Pure bliss……. 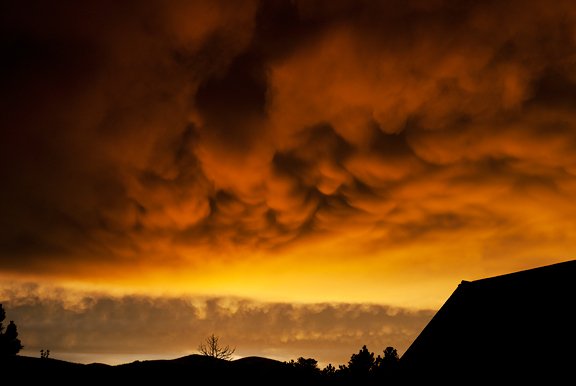 Your photos make me want to move to Colorado! And they make me want a dog, but luckily you are so honest about the commitment required, and remind me that I am perfectly happy with my beloved cats! 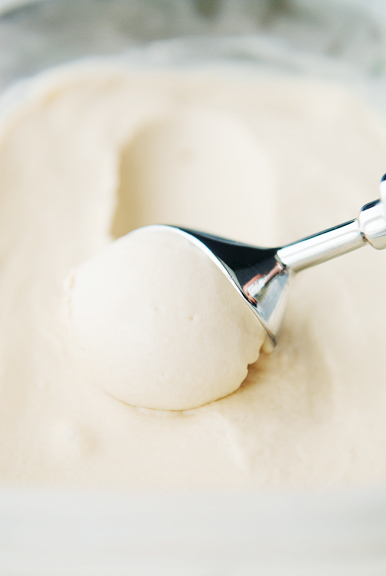 Thanks for sharing a new ice cream recipe and method that I had never heard about! Ohhhhh, Nevabean is one of the luckiest pups in the world. Her training will be a reward to you for years and years to come. 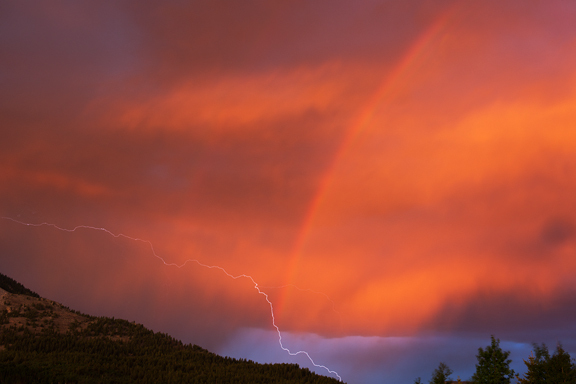 The photo you call your unicorn….amazing!!!!!! 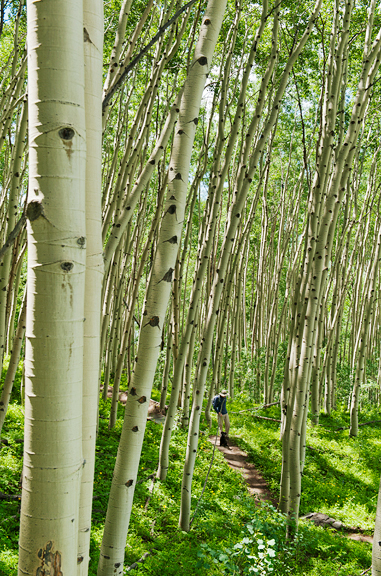 I think CB is the wildflower capitol of the…world? Lovely. and yes, achoo! OMG, the bell trick! We trained our cats to bang the bell on the outside to let us know when they wanted to come in. We would jump up when we heard it. So tell me, WHO TRAINED WHO? I love White Russians and mostly drink them in the winter. This would be a perfect way to have them in the summer. Beautiful photos, Jen. Thank you so much for sharing. Neva is adorable. I’m happy for you! I love the title of this post, “The Continuing Adventures of Neva!” She could not be more adorable. You and Jeremy sound like brand new parents of a baby human, actually. After all the love and attention Neva will be a perfect little doggy and well trained. I love seeing her photos and have to show them to my hubby. We have always had labs. Three yellows, two blacks, over the years but usually adopted from a lab rescue. 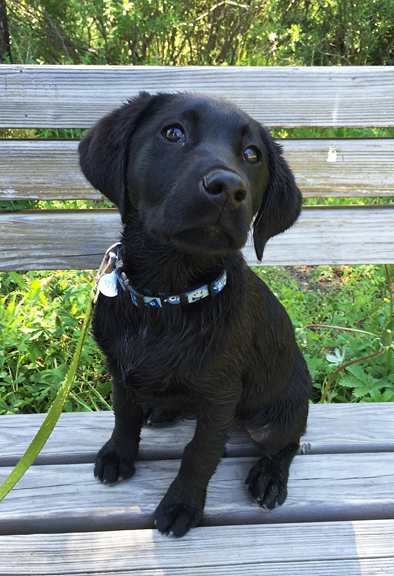 It’s been a long time since we had a lab puppy! Oh dear! I think it’s been almost 20 years since a lab puppy came to live with us. 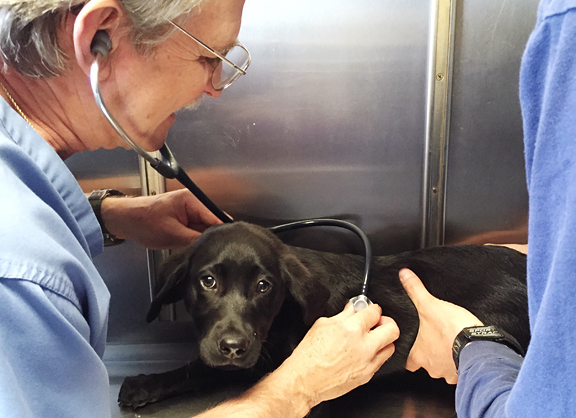 My hubby says that it takes at least two hard years to train a lab…..so hang on! Thanks for letting us see Neva. I recently discovered your blog and I love it!!! I also went to Cornell and got myself an engineering degree and I food blog as a creative hobby. This ice cream looks so good! I like a firmer ice cream so I might try and make this with a little less alcohol, which would make it set up firmer, right? Neva is adorable. I have a black dog too (though he has a few grey-ish hairs in his tail and a white patch on his chest). LOVE DOGS AND LOVE FOOD. farmerpam – oh, we’re just trying to train Neva early on to avoid some of the mistakes we made with Kaweah. While Kaweah was a very sweet girl, she was just TOO enthusiastic when she was on the trail and would pull us for miles and miles up (and down) mountains. Mom24 – oh, our solution (for sanity’s sake) was to remove the bell! Now she sits at the door until one of us notices and we take her outside. jill – I hope so! 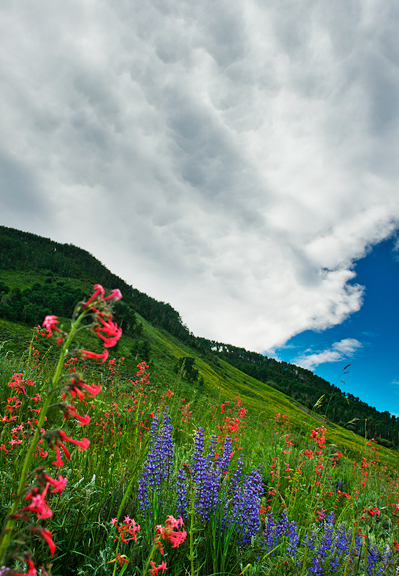 :) And yes, CB is the wildflower capital of Colorado.